It’s wonderful to think that your beloved family pet may be able to alert you to cancer of which you were previously unaware, but science hasn’t proven that it’s possible yet. And while the many stories that go viral in which owners swear their pets sniffed out their underlying disease—such as that of a little boy named Luke and his black Labrador Retriever—are anecdotal at best, there is medical evidence to support that disease and scent are certainly linked. It is harnessing knowledge of these smells, rather than training pets to detect illness, that holds promise for the future of cancer research. One study published in the BMJ found that, “…specific cancer scent does indeed exist and that cancer-specific chemical compounds may be circulating throughout the body.” And though the study stops far short of concluding that animals should be employed as early detectors of such diseases, it does recommend examination of these compounds to learn more about how to capitalize on the smell of cancer. 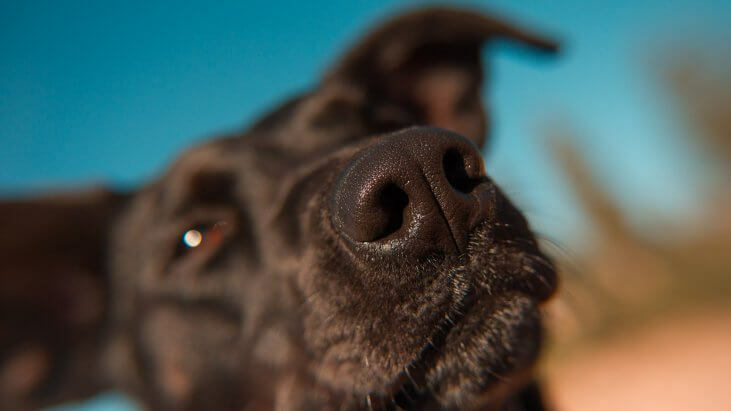 Similarly, a study published in the European Respiratory Journal found that so-called sniffer dogs were able to smell lung cancer on the breath of 71% of participants with the disease. Even further, dogs that were specifically trained for such detection were accurately able to identify lung cancer in 99% of participants and breast cancer in 88% of participants. Again, though, it’s important to understand that pets should not be trusted to identify cancer as a preventative measure. Michelle Pierson, a 48-year-old woman from Oregon who credits her rescue cat, Mia, with alerting her to an unusual lump in her right breast, says her story should inspire women to get mammograms, not listen to their pets, necessarily. Speaking to their local NBC affiliate KGW8, Michelle says, “My husband and I were lying in bed watching TV, when out of nowhere, Mia got up on my chest, sniffed my right breast and looked in my face. She sniffed the spot again and looked at my face and I tried to shove her off. She came back up and just laid down on that right breast and looked at me like, ‘I’m trying to tell you something.’” Will felt the lump himself and encouraged his wife to get checked out, and soon Michelle received the Stage 2 breast cancer diagnosis from her doctor. Since early detection was the key to Michelle’s good prognosis, she is reminding those who are touched by her story to stay on top of their screening. The best way to do that is to follow recommendations on breast cancer screening and mammograms. Even further, it’s important to know that a standard mammogram may not suit all women. For example, Dr. Lehman says, if you have dense breasts, a 3D mammogram facility may be your best bet. As always, it’s wise to discuss all options with your doctor to choose the exam that’s right for you and how often to get them.